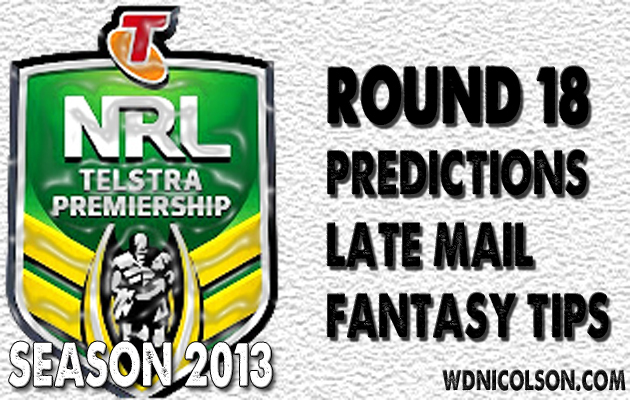 For our analysis of Tuesday team selections for Round 18 - click here. Voting Allocation for Round 18 of the NRL is below. Cronulla had this game last year v an Origin-less Broncos - and won convincingly. Realistically despite Lewis, Gallen and Fifita missing for the Sharks - they should do the job again on the QLDer-less Broncos. Brisbane can't create genuine chances with Peter Wallace and Scott Prince together - but we've discussed this before haven't we? If Andrew McCullough and Corey Norman have stunners - Brisbane are a chance... but Todd Carney went alright last week - so stick with the Sharks by 10 points. BRONCOS: Hannant is the big concern as he apparently 'tore' his calf before the Warriors game in Round 16. Lama Tasi probably gets a run regardless, while David Stagg and Jordan Kahu also return from long injury layoffs. Would be surprised not to see Scott Anderson in the final 17. LATE UPDATE? Hannant is OUT. Hala starts, Anderson onto final bench. SHARKS: Everyone wants to know about Michael Gordon's calf... but from his own tweets - he's not sure about it either. Friday night might come a little early for him to play this week... so for his sake - hopefully he's back next week (you've heard that before). Nathan Stapleton - not Stewart Mills - would go to fullback and Ben Pomeroy would move in to the centres with Mills to the wing. LATE UPDATE? Gordon IS playing. Pomeroy drops out. Parra just dropped Chris Sandow... for the awe-inspiring halves combo of Luke Kelly and Ben Roberts. The Panthers on the other hand have opened up the game plan and even Luke Walsh looks like a good footy player in the ad-lib structure... translation: pick Penrith. Panthers by 16 points. EELS: Jarryd Hayne will not play... check his status for Round 19 come Round 19. Willie Tonga expects to play his first game of the year, while yes Ben Roberts looks like he'll play five-eighth. Will there be late changes? Expect at least one, remember the Eels played Monday night footy - so this didn't have to be their actual team given it was named less than 24 hours later. LATE UPDATE? Sandow won't play NSW Cup... or the NRL for that matter. Hayne reckons he's a chance as well! Sio OUT/Radradra IN. PANTHERS: Matt Moylan probably holds his spot despite a so-so game last week, while Lewis Brown's hamstring is all that stands between Ryan Simpkins and another run off the bench. Look Canterbury need to have a serious look at how they 'attack' inside the attacking 20m zone... but they should still win this game. I say should... I didn't say will. I can't pick Melbourne because scoring points without their Big 3 is tougher than picking a broken nose but Canterbury's attack is woeful inside the 20m zone. 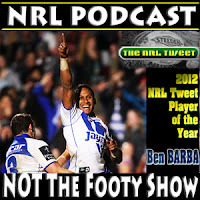 Just give it to Barba and things might go better Des Hasler... and yes it might be that simple. Bulldogs by 12 points. BULLDOGS: The Dogs expect Mitch Brown to play despite a sickening head on knee clash last weekend. Sam Kasiano and Greg Eastwood should play after missing through injury against the Knights, meaning Tim Browne and Martin Taupau drop out. LATE UPDATE? Josh Reynolds is back after being released from the NSW squad. He'll play 5/8, Romelo out. Kasiano is ill and Pritchard is still dusty after a head knock last week - so Browne and Taupau join the squad. STORM: Craig Bellamy loves a late change and given he named a 19 man squad - you won't know til kick-off what changes he'll make. Cagey customer, especially naming Ben Hampton at halfback after playing him at fullback against the Gold Coast last time they played in an Origin week. Cowboys without JT... Manly without DCE. One has happened a lot... the other is about to happen for the first time since he made his debut. Manly will miss Cherry-Evans big time - after he rebounded from a barren patch of form with a quality dissection of Parramatta, while North Queensland's promising two match winning streak came to an end in the 1st half in Canberra. Manly miss DCE and Watmough, Nth Qld miss JT, Tate, Scott and Tamou... might be in Townsville but you have to pick Manly - especially with the way Foran and Brett Stewart played last Monday. Sea Eagles by 10 points. COWBOYS: Dallas Johnson copped yet another head knock last weekend so not convinced he was entirely dropped this week. So he might actually be a late starter given the game is Monday. Michael Morgan is long odds with a bad shoulder, so expect the Lui/Thompson combo on gameday. Only question is whether or not Sims and Cooper start despite being named on the bench. LATE UPDATE? Sounds like Bowen is playing after all. Greenshields out. Morgan starts at 6. SEA EAGLES: Manly will settle on their squad by the time they fly out on the weekend - giving George Rose (ankle) a few more days to prove his fitness. Does Peta Hiku play halfback? Don't see why not - there's not many other options for Manly actually. Glenn Stewart should be fine after a poke in the eye on Monday. LATE UPDATE? Hiku to centres, Lyon to five-eighth and Foran to half mentioned. Hasson starts, Buhrer to bench, Rose out, Skinner in. What are your tips for Round 18?